PWNA serves 60 reservations in 12 states throughout the Northern Plains and Southwest regions of the United States. We focus on underserved and geographically-isolated Native American communities with limited employment opportunities, addressing both immediate needs and working towards long-term solutions. We build upon assets within the communities we serve, bringing together individuals, programs and outside resources to address challenges and support positive change. This community-driven model leverages the social capital of a larger network mobilizing toward a common solution. These are the major program categories through which we provide materials for immediate needs, as shown on our Form 990. High school dropout rates range from 30 to 70% on the reservations. PWNA furnishes essential school supplies for more than 28,000 K-12 students on 25+ reservations. We also support literacy for Native youth, providing supplies and incentives to encourage parent-child reading time. By addressing both immediate and long-term educational needs, PWNA helps our partner schools and colleges motivate students and retention. (Related programs: American Indian Education Fund (AIEF) and Northern Plains Reservation Aid (NPRA). Our health services support reservation programs that address preventative care, home health visits and health education initiatives for tribal members. The people PWNA serves on remote and isolated reservations rely on limited Indian Health Services (IHS) for medical care. Transportation is a major problem because of the long distances to clinics and the lack of transportation. Severely underfunded and understaffed for the size and location of the populations it serves, IHS focuses on healthcare crises rather than preventive care. (Related programs: Northern Plains Reservation Aid (NPRA), Southwest Reservation Aid (SWRA), Native American Aid (NAA), Navajo Relief Fund (NRF), Sioux Nation Relief Fund (SNRF) and Southwest Indian Relief Council (SWIRC). 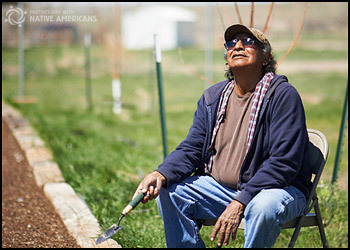 Our Food & Water services ease food insecurity among Native American Elders, children, and families. Because low food security is an everyday issue on the reservations PWNA serves, nutrition-related disease rates are high. Contaminated drinking water is also an issue in many of the communities we serve. Although many food banks operate within our service area, a study by America's Second Harvest shows that the majority of food banks lack an adequate supply of food to meet demand. (Related programs: Northern Plains Reservation Aid (NPRA), Southwest Reservation Aid (SWRA), Native American Aid (NAA), Navajo Relief Fund (NRF), Sioux Nation Relief Fund (SNRF) and Southwest Indian Relief Council (SWIRC). Up to 43% of Native American children live in poverty, many of them raised by grandparents on limited fixed incomes, and families cannot always afford special holiday gifts or extras. PWNA’s Holiday services help our reservation partners spread community cheer and participation at times when many families are experiencing more stress and disenfranchisement. We provide holiday gift stockings for more than 50,000 children, teens, and Elders during the Christmas holiday season. These stockings are filled with practical items to meet immediate needs. In addition, children and families receive incentives and prizes when they come together to participate in spring, Easter, and other community gatherings. These types of holiday events also help partners and local volunteers develop skills for future event planning and community service. (Related programs: Northern Plains Reservation Aid (NPRA), Southwest Reservation Aid (SWRA), Native American Aid (NAA), Sioux Nation Relief Fund (SNRF) and Southwest Indian Relief Council (SWIRC). The rates of poverty on the 60 reservations served by PWNA range from 38% to 85%. A long history of oppression has contributed to the limited view of opportunities many Native Americans envision for themselves and their families. Our Community Support services help reservation partners motivate involvement in community service and to support programs concerned with animal welfare on the reservations. (Related programs: Reservation Animal Rescue (RAR), Northern Plains Reservation Aid (NPRA), Southwest Reservation Aid (SWRA) and Southwest Indian Relief Council (SWIRC). When the January 21, 2010, blizzard caused a state of emergency for the Cheyenne River Sioux Tribe, the news and call for help did not reach mainstream media until 11 days later. This is often a common occurrence when disaster strikes the reservations. Our Emergency Services provide disaster relief for tribes and seasonal weatherization and housing assistance for Native American Elders. The physical environment on the reservations we support is often harsh, giving rise to a wide range of environmental disasters such as floods, forest fires, blizzards, ice storms, tornados, and hurricanes. As a first responder, PWNA also provides immediate disaster relief for tribal members who are displaced due to blizzards, hurricanes, floods, and contaminated water emergencies. PWNA also offers seasonal support in selected reservation communities, based on need. Due to the expense and logistics, we are unable to offer these services to all reservations. We also assist homeless shelters and other residential facilities on the reservations we serve. (Related programs: Northern Plains Reservation Aid (NPRA), Southwest Reservation Aid (SWRA), Native American Aid (NAA), Navajo Relief Fund (NRF), Sioux Nation Relief Fund (SNRF) and Southwest Indian Relief Council (SWIRC). Like our Material Services, Long-Term Solutions are critical to our vision of strong, self-sufficient Native American communities and support the self-determined initiatives of reservation partners and other local leaders who are working for sustainable gains in their communities. While some of PWNA’s long-term services are new, they are already yielding positive outcomes for partners, participants, and communities on the reservations. Only 17% of Native American students start college and only 11% complete college. Many Native students believe college is not an option for them and, contrary to public perception, college is not free for Native Americans. PWNA’s Higher Education Services increase college access and retention for Native American students. Our Higher Education services assist more than 350 Native students each year. Our Capacity Building services equip our reservation partners who want to make a greater contribution to their communities. PWNA has been testing and revamping our formal training service with reservation partners since 2012, resulting in a new service that is unlike any offered in Indian country. This new training is a direct result of feedback from our reservation partners about needs and next steps that will help them be more effective. Currently, our Capacity Building program includes one service: the Four Directions Leadership Development (4D). This training is designed around a six-month program, with partners committing to personal and professional development goals and working with mentors for support in attaining their goals. Our first cohort completes training this Spring. PWNA will track and report the progress of the participating participants for up to three years after program completion. PWNA is expanding Capacity Building services in 2015 for both Southwest and Northern Plains reservations. Up to 23% of Native American families live with low food security, and nutrition-related disease is disproportionately higher than other Americans. American Indian families are more threatened by low food security than other families in the U.S., and they experience the highest rate of diabetes. In addition, suicide rates for American Indians between the ages of 15 and 24 are 3 times the national average — and the second leading cause of death for their age group. PWNA’s Community Investment Projects support community champions who lead grassroots projects in reservation communities. These projects aim to positively impact the lives of tribal members and to deliver some type of sustainable gain for Native communities. Our community investment projects are longer term in nature and involve tracking outcomes over a period of 6 months to 3 years. For samples of our Long-Term Solutions projects, see our Annual Report.